If Thrall and Jaina Made a Baby. I have a small thing for Thrall. I admit that liking a green orc is probably not the sanest thing a Night Elf could um uh… lust after admire, his strength and honor, his leadership, his bearing…. I wanted him and Jaina to get together. Imagine the scandal.. I’m not that big into lore, but the outrage across Azeroth. Jaina carrying Thralls Love child. Hey I’m all up for that. I hear they have Pallys horde side too. 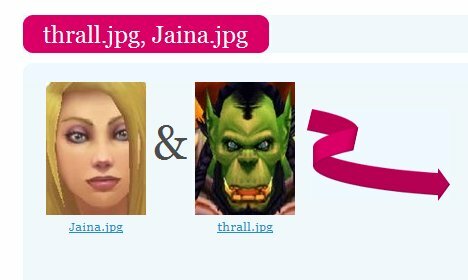 It’s not a great rendering.. the whole facial shapes / tusks / greenskin, and the hair over Jainas face has made it a really weird pic. You have to be a little patient with it, the rendering can take a little time, and you need to ‘prepare’ your images. The poor kid has a wonky nostril, and I would really feel sorry for when he grew up because he does look a little girly and his skin seems to have gotten greener over time. I have no photoshop skills.. ( or Gimp Skills) So I can’t clean up the image.. If I ever learn to use to properly I’ll have another go. Read blogs, write blogs, think about blogs. Sometimes I have time to play WoW. I am so with you on this one!! Hang on, what did she do with my baby?